Bicyclists took to the streets last Friday evening, adorning Halloween costumes and helmets as participants promoting bike safety. 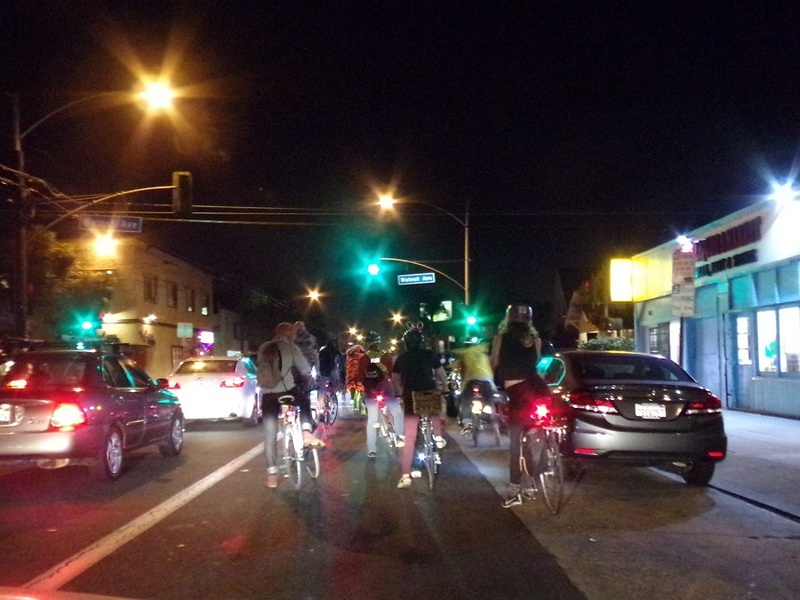 The group ride, organized by anonymous individuals through Critical Mass Long Beach, created the event as an anniversary ride in celebration of the first Critical Mass in Long Beach in 2010. About 50 riders made their way to the Belmont Plaza Olympic Pool in Belmont Shore to begin the ride, which started at the beach bike path. Christina Ragsdale, co-founder and communications director of LBcycology Bike Collective, assisted with the organization of bike safety for riders. The first Critical Mass held five years ago resulted in over 70 citations and more than 20 bicycles impounded. Ragsdale emphasized a change in the way the ride was organized. Organizers did not publicly release any route for safety reasons. Most riders had no idea which bike paths or sharrows the group would take, with the only hints from organizers stating they would begin at the beach and end at the Aquarium of the Pacific. Pedal Movement and LBcycology Bike Collective, both organizations that promote bike safety and education, worked hand-­in-­hand in making the ride successful. LBcycology placed six marshals throughout the ride that would not only look out for riders’ safety but also maintain all riders on route. Through donations from Pedal Movement, LBcycology was able to hand out lights to riders in need. All participants ended the ride on a jovial note. Many riders applauded as they arrived at their end destination.